Does a Scientific View of Ourselves Undercut Science? Newsome is particularly concerned with a point he quotes from a 1927 work of J. B. S. Haldane: “If my mental processes are determined wholly by the motions of atoms in my brain, I have no reason to suppose my beliefs are true . . . and hence I have no reason for supposing my brain to be composed of atoms.” Newsome takes this point to suggest that a consistent scientist must make room for free will. But he recognizes that a consistent scientist must make such room without supposing there are exceptions to what science shows us about the laws that apply to the motions of atoms. These two demands seem to be in considerable tension. In my view, this is an interesting example, because it actually shows us how to undercut Haldane’s point and resolve Newsome’s worry without having to make the puzzling distinction between constraint and determination. Why do I say the distinction is puzzling? Because “determination” is a term that suggests causation. (That is, for example what Haldane means by “determined” in the sentence Newsome quotes.) But, first, that’s not what Newsome means by this term: “determination”, according to Newsome’s explanation, only means that there are higher level descriptions that can be used to express useful regularities. (Descriptions “at a higher level” do not refer to the small parts of what’s being described.) And, second, “determination” cannot add any causes to what the lower level provides. If it did add anything, there would be something that happened that was inconsistent with the constraints imposed by the laws that apply to the behavior of the small parts (the transistors, capacitors, and so on). Newsome agrees that everything that happens during the execution of MS Word is consistent with the laws of operation of the small parts of the computer on which it is running. It is also clear that what happens can be described at a higher level at which useful regularities can be expressed. For example, a certain series of keystrokes always results in highlighting a portion of text. A following press of the ‘delete’ key removes the highlighted text; a following click on the paperclip does something else, and so on. The moral that these facts illustrate is this: A thing whose small parts operate according to ordinary physical laws can have regularities describable at a higher level, provided its small parts are organized in the proper way. 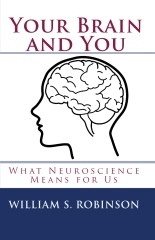 There is thus no conflict between holding (1) that everything in a brain happens as a result of its small physical parts (e.g., neurons, synapses, glial cells, neurotransmitters) operating according to physical laws and (2) there is a higher level description of what brains provide that explains how we normally perceive accurately and often reason correctly. Of course, atoms and molecules that are *not* organized in a very special way do not lead to accurate perceptions and reasonable conclusions. But that does not show that properly organized systems of atoms and molecules cannot conform their outputs to evidence and logic. “Free will” is used by many thinkers in many senses – that’s why I avoid using that term, except when I write about the views of others who do use it. One of its senses requires that there be departure from causation. In *that* sense of the term, it should be evident that “free will” is something we do *not* want when we are doing science. What we want is that our beliefs about what is in the world should be caused – namely, caused by the things that we believe are there. If our beliefs about the world were cut loose from being caused by what is in the world, we could only expect to have erroneous beliefs about the world. This entry was posted on Sunday, October 10th, 2010 at 3:48 pm and is filed under causation. You can follow any responses to this entry through the RSS 2.0 feed. You can leave a response, or trackback from your own site.